In honor of Cinco de Mayo, here is a fresh take on a classic comfort food. The pizza starts with a whole wheat base and fire roasted salsa. Next, the pie is dotted with a southwestern bean dip, caramelized onions and roasted corn. Finally, turkey chorizo sausage, pepper jack and cheddar cheese take the pizza to a whole other dimension. Fortunately, this is one pie that you can turn to like a lost friend...you'll want to eat My Mexican Pizza once again. Shallots are an easily forgotten, yet delectable cousin to onions and garlic. This recipe showcases their brilliance while providing an alternative to boring, predictable onion dip, and can even make you the hero with the best snack at the Super Bowl Party. Well, lets not get crazy. While considering the Super Bowl party I'm not having, I started thinking about all the great appetizer-type dishes that make these parties fun for those of us who aren't such big football fans. There are the classics, of course, and the misadventures (usually in the form of a seven-layer-bean-dip) - but good food always makes a good party. I've only made these twice, but each time they were well received. I'd be interested to hear how other folks prepare stuffed mushrooms. It seems to me there are lots of options here. Anyway, here's how I do it. 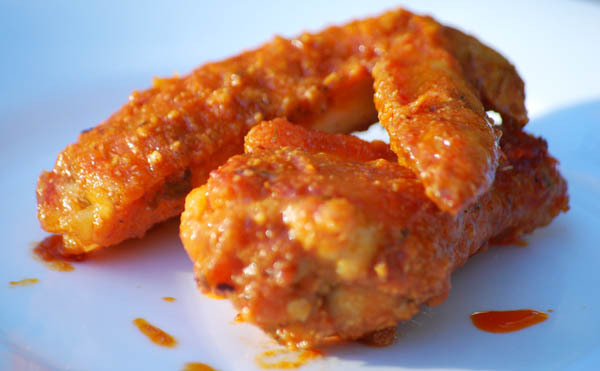 Buffalo Chicken Wings seem to go hand in hand with autumn. Maybe it has something to do with football, or maybe buffalo wings just make for a nice transition from outdoor grilling to indoor cooking. Whatever the reason, the recipe is fairly simple, though I depart from the original by baking my wings instead of frying, and adding a couple ingredients to the sauce. As the summer draws to a close more and more fresh corn will be available at your local farm-stand-on-a-dusty-corner. I tend to buy too many ears than we can possibly eat at one sitting but, as I've mentioned many times, leftovers make me happy. 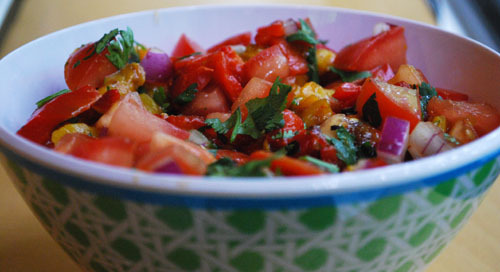 Here's a quick salsa to use up all that leftover grilled-or-boiled corn you're sure to have this season. I really dislike canned / jarred salsa. The texture is often too pasty and there's zero freshness when all that really matters in good salsa is fresh ingredients. I like to balance mine with a bit of sweetness. Sometimes I'll use fruit (mango, for example) and sometimes I'll use roasted peppers. Roasting your own peppers takes a little more time, but it makes the dish.